I close Microsoft Outlook by accident on a regular basis, so I decided to see if there was a way to avoid doing this and I found a solution. It’s very easy to accidentally close Outlook by clicking on the X in the upper right-hand corner, instead of the minimum button. There are several ways you can prevent this. Note: If you have Outlook 2003 or above (I tested it in Outlook 2013 at it works just fine – Tony) , its possible to set it to minimize to the tray (notification area). Many users don’t realize they enabled this option and think Outlook closed when they minimized it. Look for the Outlook icon in the notification area to verify Outlook is not running minimized. Open a new message – enter “Keep Outlook Open” as the subject. Don’t enter an address in the To field! Save the message to Drafts. Drag it from Drafts to the Outbox. When you exit Outlook, you’ll have the chance to cancel closing Outlook. 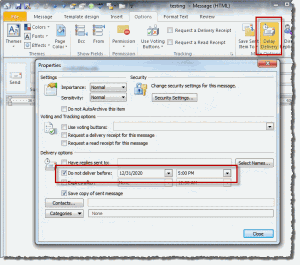 The “Unsent Method” mentioned above does not work in Outlook 2010. In fact, in Outlook 2010 RTM (the released version), there is no unsent message warning, even for “real” messages in the Outbox. SP1 restores the warning but it only works if messages are send-able, meaning the Unsent Method above is still useless. 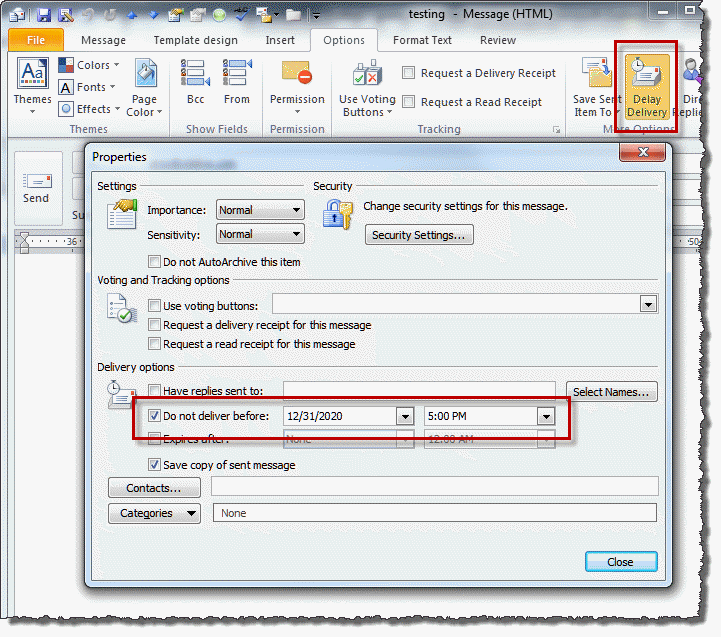 However, you can set Outlook to delay delivery of a message to force the warning and prevent accidental closing. Choose a date in the future in the “Do not deliver before” date field. Please note, this only works in cached mode. Delayed messages are stored on Exchange server in classic online mode.